Ullmann is seeking two more local restaurants to be featured on the show. Suggestions can be made on the show’s website, www.whatsonthemenu.net. People can also refer to both the website and Facebook, www.facebook.com/whatsonthemenumichelle, for updates on release information and to view teasers of the establishments where filming has already taken place. Michelle Ullmann, an actress and president/CEO of Bored Puppy Productions, has travelled all over the Denver-metro area seeking out unique, locally-owned eateries to feature on a new TV show. And she recently set her sights on two Golden establishments — Bob’s Atomic Burgers, 1310 Ford St., and Café 13, 1301 Arapahoe St. “We all have our favorite chain restaurants,” Ullmann of Parker said. “But it’s super important to support local places.” The show is called “What’s on the Menu with Michelle Ullmann” and it will consist of 10 episodes for its first season. Currently, the show is in the process of promotion and seeking distribution, Ullmann said, with the goal for it to be aired on national television. “It’s to encourage people to try something new,” Ullmann said, “whether it’s a new food you’ve never tried before, or a locally-owned restaurant you’ve never been to before.” Ullmann does have criteria that has to be met for a restaurant to be featured on the show. 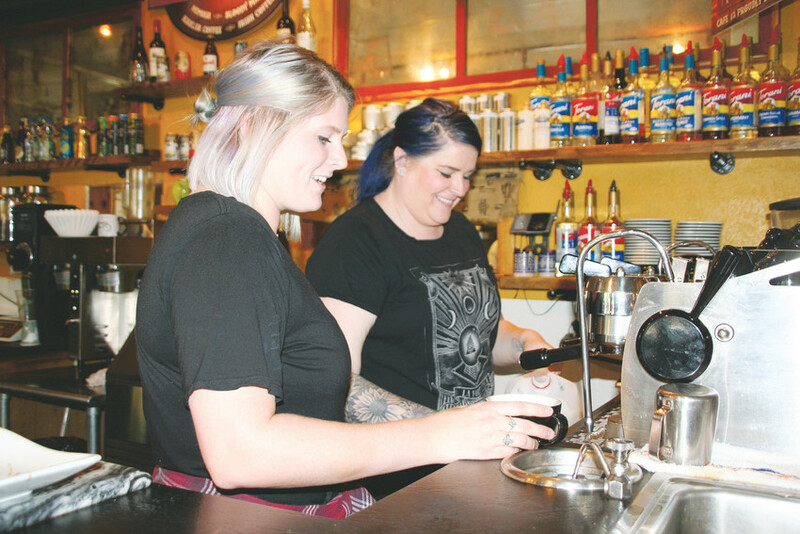 First and foremost, it has to be locally owned by a Colorado resident, she said, and the food has to be primarily homemade and/or made-from-scratch. And, “they have to put care into what they do,” Ullmann said. She also considers the quality of service and the establishment’s cleanliness. “It kind of all has to be there,” Ullmann said. And “if I’m going to be recommending it on national television, people need to be able to trust that it’s going to be consistent.” The business must be in operation for a minimum of one year and never featured on any other food or travel show. Two more restaurants are yet to be determined before season one is complete, Ullmann said. Then, then season one will be laid out. With the show, Ullmann hopes to promote travel and tourism, support community and target a millennial audience. Starting the show in Colorado felt fitting because it’s “where our mouth is,” Ullmann said. But following seasons will feature locally-owned establishments in different states, and Ullmann already has a trip planned to start scouting for season two in Arizona. Filming the first season began in February, with Bob’s Atomic Burgers being the first place filmed. However, Ullmann expects the episode to air mid-season, and will premiere the show with an episode featuring La Baguette De Normandy, a French bakery that offers breakfast and lunch, in Parker. Café 13 will be featured in an episode shared with a bed and breakfast in Denver called Castle Marne, specializing in an afternoon tea. Filming at Café 13 will take place on June 9 and 10. “Customers are welcome to come and tell our cameras what they love about it,” Ullmann said. The crew will spend a couple hours interviewing a few customers, Ullmann said, and although the time is not specifically set, Ullmann recommends people come in the early afternoon on June 9 for a chance to appear on the show. Located in the historic Armory building and affectionately referred to as Golden’s living room, Café 13 is a coffee shop that serves pastries and breakfast and lunch items. The coffee comes from Conscious Coffees, a roaster in Boulder. Sedalia residents Gary Ruhnke and Dan Maier took over Café 13 on April 1, 2013. Ullmann is seeking two more local restaurants to be featured on the show. Suggestions can be made on the show’s website, People can also refer to both the website and Facebook, www.facebook.com/whatsonthemenumichelle, for updates on release information and to view teasers of the establishments where filming has already taken place. Michelle Ullmann, of Parker, is the host of her new show "What's on the Menu?" where she explores local food spots. The premise is, No. 1, supporting locally owned restaurants. We all have our favorite chains, we all have a habit of going to those chains, yet we've got all these wonderful small businesses that struggle to survive and many of them have something very wonderful to offer. We tell their story as a family. We don't just say “here's what they have to feed you.” We talk to them, we sit down, we do an interview with the owner — how they got started that sort of thing. Then we talk to their customers and we try to get a mix of old customers and new customers because you get varying responses. The community. We came from Arizona and before we moved here, we came here for a week and we were looking for different areas. We were looking all over the place. Parker in particular was a little more laid back, still kind of a nice area. The neighborhood in particular reminded me of my childhood. There's a lot of animals and trees and the people are friendly. It was quite different from where I was living in the previous 10 years, where people would rather scowl at you than smile at you. It was just so welcoming. Raising our small kids, that was really important to me. I wanted a lot of nature, I wanted people without a huge chip on their shoulder, and this community just really offered that. Submit your email address for updates and release information!